Vlaminck was the "fauvest" of the fauves, the most inclined to expressive violence. He was, among his colleagues, the only painter who declared he was proud never to set foot in the Louvre, and believed that each generation of artists had to start from scratch. However, his oeuvre does not lack masters and precedents. In 1901, Vlaminck was dazzled by an exhibition of works by Van Gogh at the Galerie Bernheim Jeune, and he adopted the intense colours and the passionate execution of the Dutch painter. After his fauvist adventure of 1905-1906, the second decisive influence in Vlaminck's oeuvre was Cézanne. Towards 1907-1908 he fell, like Derain and Braque, under the spell of the painter from Aix and began to pay greater attention to the formal construction of his paintings. The spirit of Cézanne manifested itself in the presence of cubic shapes, in the use of stronger contrasts of light and shade, and a darker palette. But even in his most Cézannian period, Vlaminck still tender towards chromatic excesses. "M. de Vlaminck [wrote Apollinaire in 1908] has a Flemish sense of joy. Painting for him is a kermesse". 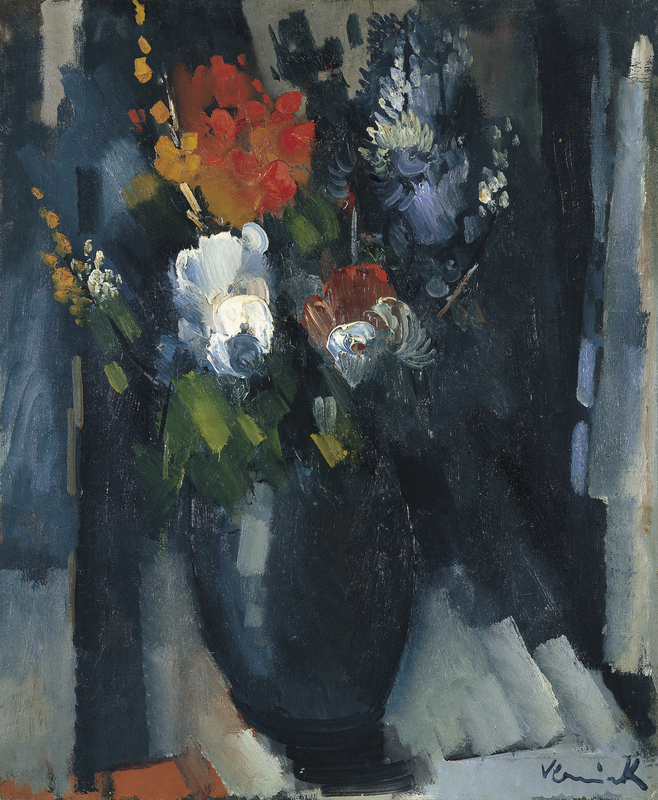 Towards 1909, he painted a few vases of flowers (with which this particular picture shows considerable affinities) dominated by intense colour and the tendency to use shapeless forms. The vase of flowers, one of the most conventional genres in pictorial tradition, becomes here an occasion to display the freest and most exacerbated firework show: a cascade of warm colours, reds and oranges, falling on the cold, nocturnal background of blacks and blues. The hurried and violent brushstroke, wet on wet, with the canvas spread and spattered with splashes of colour, is a plea in favour of pure movement as a legitimate means of giving meaning to painting.